Getac is one of the trade's pioneers in the area of robust, mobile computers, and the forerunner in calculating and data collecting solutions for particularly demanding and critical applications. For more than twenty years, the Taiwanese manufacturer has been independently developing and producing robust notebooks, tablet PCs, convertible PCs and handheld computers protected against environmental influences. Getac is a 100% subsidiary of the GETAC Technology Corporation, belonging to the Mitac Synnex Group, whose 40,000 employees generated 18 billion US dollars in sales in 2009. The high-end devices are partially certified for various standards onsite; as further needed, they are licensed for a range of requests with licensed companies and then officially released. Customer groups ranging from the military, police, public safety, as well as energy providers, mechanical engineering and production industries use Getac systems in areas such as field service and maintenance, as well as various types of sales force uses in which users rely on dependable IT systems. Getac offers a high standard of quality and flexibility for integrations opportunities, as it develops and produces over 80% of all its products. The manufacturer calls on its own extensive technological product development and finishing resources. Each production step, from development to the end product, undergoes strict quality control. 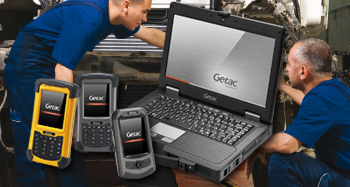 Based on its superior product quality and technology, as well as its customer-oriented product range, Getac is currently one of the leading providers of robust computers and handheld solutions for particularly demanding applications. Worldwide successful projects, with large numbers of items put to use in the most different sets of circumstances, confirm the high performance of these professional devices. You receive these rugged and semi-rugged notebooks, as well as the incredibly robust handheld PCs directly from stock at Jarltech. These multiple devices are immediately available for use, including the accustomed high speed and service offers (which are profitable for you), not to mention the guarantee.